I’ve never been a “tell me what I want to hear” kind of person, but this really comes down to professionalism and good judgement. If you aren’t able to answer that question correctly, It makes me worry about how you will answer more difficult questions that clients may ask you. Don’t wear a shirt that intentionally shows your bra. I don’t care if it is La Perla. 6-inch platform Lucite heels are not a good choice for interview footwear. For the LOVE OF GOD do not, under any circumstances, wear a BLUETOOTH in an interview. Unless you hold the keys to missile defense, you are not that important. I promise. Write a cover letter, this alone will put you above half of the other applicants and give you a voice. Change the “Objective” field to fit the company you are applying for. It is a huge red flag if it does not match who we are. Either you are sloppy and have no attention to detail, or you really don’t want to work for us. If you have a email address, such as ChicanaSkank69@[domain].com don’t put it on your resume, take the ten minutes to set up a free, more professional looking email address using your name, for instance: JackieJDodd@mail.com. That was an actual email address I got from one of the applicants (domain has been changed to protect the obviously not so innocent). If I call you for an interview, don’t wait 3 days to respond. I’m not some chick you banged in the bathroom of a TGIFridays, the three day rule does not apply. If you say that you are “Detail Oriented” at least spell both words correctly. Ugh. I have lost a bit of my faith in man kind after this week. But I have not lost my faith in a good soup with a pastry crust. And bacon makes everything better. This recipe was inspired by a Butternut Squash Recipe from Giada De Laurentiis. In a dutch oven, over medium heat cook the bacon until most of the fat has been rendered. Remove from heat, allowing to drain and cool on a stack of 2-3 paper towels. Drain off most of the bacon fat, leaving only about 3 tbs in the pot. Turn the heat up to medium-high and add the onions and carrots to the pot, cooking in the bacon grease until opaque. Add the garlic and cook just until you are able to smell them, about 30 seconds. Add the chicken broth and squash, allowing to simmer until the squash is very tender, about 20 minutes. Remove from heat. Using an immersion blender, blend until smooth. Add the smoked paprika, and sage, stir to combined. Add the salt and pepper, seasoning to taste. Chop the bacon into small pieces, add to the pot and stir. Place four ceramic, oven safe bowls on a baking sheet. Divide the filling equally between the four bowls. 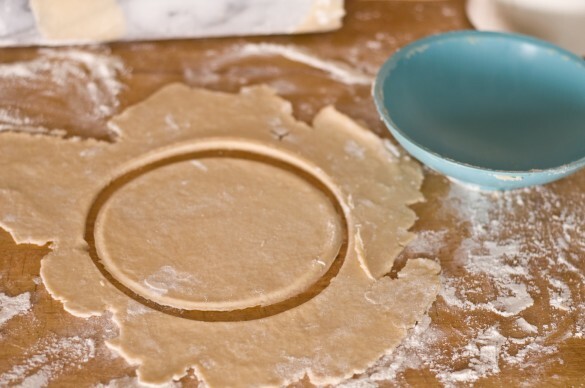 Place desire pot pie crust on a well floured surface, add flour to the top of the disk as well. Roll out into an even thickness. Cut out 4 circles that will cover the dishes with at least a one-inch overhang on each side. To prevent sticking, spray the rim of the baking dish with cooking spray. Top each dish with the dough circle, pressing into shape. Cut a few slits in the top to vent heat. Brush with melted butter. Cook at 400 for 20-22 minutes or until golden brown. Cracking up at this post! 😉 You can’t make this stuff up! Do you plan to have kids anytime soon? Lack of professionalism exists on both sides and I doubt if anyone considers giving or having an interview a fun thing,so I hope you find the right person soon. Your pot pie does look like a delicious diversion from that! Enjoy the weekend. I’ve been asked some pretty crazy things in the past too! It is true, unprofessional people are everywhere. Gosh, it’s hard to believe that people don’t have more common sense. My 25 y/o son was just updating his resume to reflect his qualifications for the specific job opening…I’m very relieved he seems to know what he is doing! I think the funniest was the email address…duh! 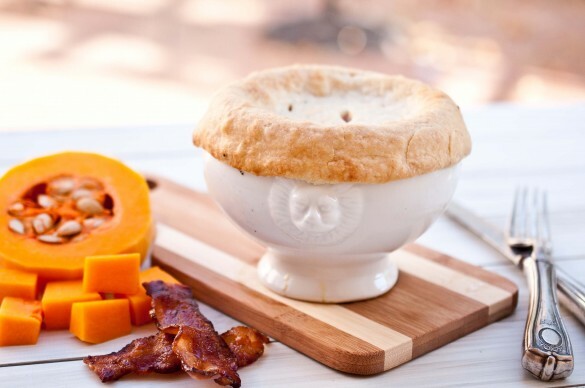 Your pot pie looks amazing…I could not resist the squash and bacon combo! You poor thing! You definitely deserve a pot pie (and a glass of wine) after those interviews! This sounds perfect! I’m still laughing!! I use to sell recruitment advertisements and always heard the funniest stories about what people would say and do!!! Its amazing…… and makes me question the human race! All I could do was laugh! Good thing the Director of Operations has a sense of humor and we could just laugh about it afterwards 🙂 I guess it makes it easier to weed people out. The CRAZY thing was that most of the people I interviewed had Masters Degrees! I kind of felt bad for her! She clearly had no idea that it was a bad idea to include that. Poor thing, hope she figures it out soon, unless she wants to be a stripper…. Butternut squash and bacon? Yes, please. I wonder how it is that people don’t know these things… how do you respond to someone who says they plan to win the lottery? Thankfully, bacon really does make everything better! Your post cracked me up and it is spot on! I have been interviewing candidates for an open position in our test kitchen and it has been eye opening! Lovely recipe, by the way! Thank you Chris! It is so crazy how different someone is from their resume and their interview. Hahaha, people behave like that in interviews? I’m so sorry. It makes me a bit relieved for my upcoming interview though, since I would never dream of doing any of those things. Also, that pot pie looks amazing. I love squash and bacon. LOL!!! enjoyed reading your ‘tips’ Jackie! Though some of then sound funny it’s amazing how some people actually need it! OMG-LOL! We do a lot of interviewing too and I am constantly shocked at applicants. We once had an applicant in response to being asked to bring to references to the interview, “What if my Spanish professor and former boss are not available to attend?” Seriously they need a nationally required college class for the basics since common sense seems to have dissapeared ;)! BTW–Pot pie looks amazing! Long live the hard working Chicano skanks all over the world! I just cracked up at your “the three day rule does not apply” advice. Sounds like you definitely deserve the comfort of pastry and bacon. I’d hire you in a second because you’re so adorable! And I sort of felt bad for these people, even though I also trying hard not to laugh! HAHAHA! I laughed through this whole thing!